and Tejman’s-United Nature Theory explained how that appears . see: Electron motion, spin waltz solution-Tejman. creation between galaxy and atom behaviour. 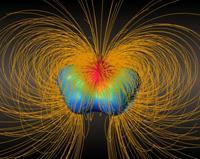 Every planet [electron-neutron swirl]has inside the sun its own electric-Kerr swirl, like as atoms quanta. 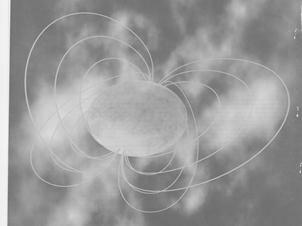 From side view, we clearly see, that solar system behave ike two swirls. Every quantum formation composed by two swirls [720’] electric and gravity. Galaxy: by disperse energetic space time and by phase transitions create stars, planets and atoms…everything. Solar system rigid quantum formation. Every qantum with its specific vibration not interact with other quantum formation. Every quatum cmpsed by two swirls and only nature explained retrograde motion of these two swirls. (1)(2)(3) The motion of Coriolis force (Energetic matter motion) (4)(5)(6) Coriolis Force – the force is the same however it has two different representations at the northern and southern parts of the earth, hence the different angles of the swirls. Gravity path from North Pole [-] to South Pole and electric paths [+] from South Pole to North direction. Our earth is neutron planet. With a lot of imagination we see these 3 steps. Only nature can explain the retrograde motion airandspace.si.edu from the magnetic poles Quantum also atom, formation composed by two perpendicular swirls electric-magnetic. Only from many pictures we can understand energetic matter behavior. Different ways, of high energetic and number, of neutrons creation. 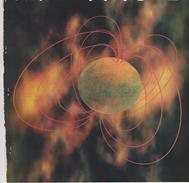 Electron wave particle react to second electron by energetic waves. By pictures I try explained the electrons and electrons pair behavior. Pict. 1 gravitational forces in very closed distance are very strong and push it pair away and rotate vertically. 3 is pulling back to its pair. By changing polarity they create virtual quantum formation. In quantum formation exist constant energetic exchange. Now appears opposite Waltz motion. Pict. 1 gravitational force in much closed distance is very strong and push it pair away and rotate vertically. Our earth is big electron-neutron that means two spins. 1 When North pole [gravity part of earth] is closed to gravity sun then gravitational forces in much closed distance are very strong and push the earth away. 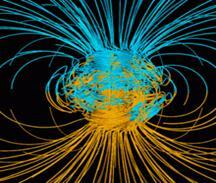 2 In distance electric forces are stronger than magnetic and the earth is pulling back to sun. That look straight but quanta rules are still far to meet.